KLM Royal Dutch Airlines is arguably one of the most technologically advanced airlines in Europe. It is always pushing the envelope in adopting and creating new technologies to further enhance its customer service. Indeed recently it announced a try before you fly option using facebooks AI ads. However, even an airline as tech-savvy and forward thinking as KLM can still offer an old school touch that is every bit as important as all the latest gizmos and gadgets. 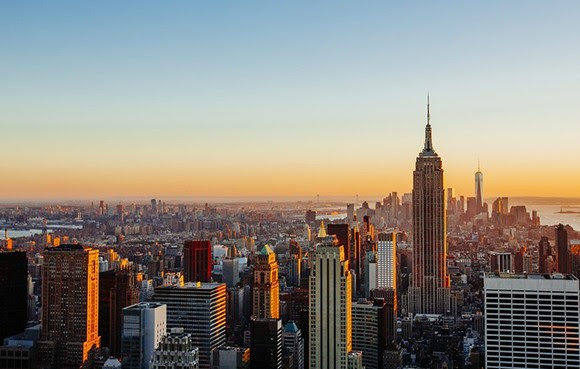 Whilst digital communications are the norm these days, of course, and the airline's customer service teams assist many people every year through those modern contact methods. 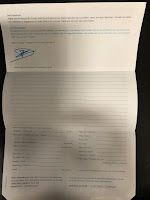 Yet, this airline with a rich history still has a prepared, old-fashioned letter entitled “Letter to the President” on board every KLM aircraft. 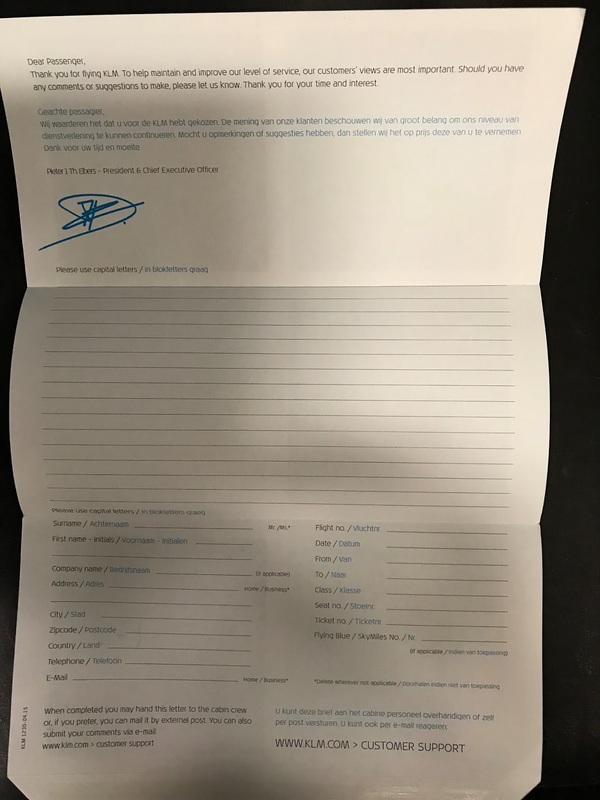 Yep, a real paper letter! The main pilot union in France, the SNPL has given advance notice that it may call for strike action to take place between 6th May and 11th May if a new law reduces its power of representation. 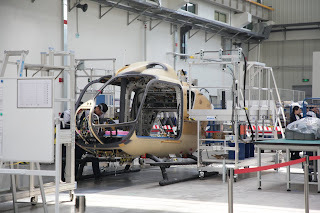 SNPL fear that proposed laws being debated by lawmakers could include them with other large trade unions in the sector in negotiations with legislators or employers, drowning out their voice particularly on issues that directly affect pilots. Local media reports indicate the union has issued a nationwide strike notice to the Prime Minister, Edouard Philippe, Muriel Penicaud, the Labour Minister and Minister for Transport Elisabeth Borne. The Chinese HNA Group has strongly denied accusations of embezzlement, financial irregularities and mismanagement made by a rival group of shareholders in Hong Kong Airlines (HKA) as the two battle for control of the troubled airline. Zhong Guosong and Frontier Investment Partner hold 61% of the firm and made the allegations earlier this week as well as declaring they had taken control of the carrier as well as making Zhong Guosong the chairman after a special extraordinary shareholder meeting on Tuesday. According to local media, an investigation has been started into the embezzlement of Hong Kong Airlines assets and other serious financial misappropriation by the HNA Group. However, the Chinese conglomerate refuses the allegations, a spokesperson told news agency Reuters they were flase, whilst assuring that the "HNA Group is committed to the highest standards of integrity in all of its activities and expects the same of all of its representatives,"
KLM has become the first airline worldwide to run a campaign using Facebook’s Augmented Reality (AR) ads format aimed at promoting its beautiful – perhaps for most travellers less well-known – destinations on Facebook. Cities like Taipei, Edmonton and Stavanger will now be a click away using this interactive technology. 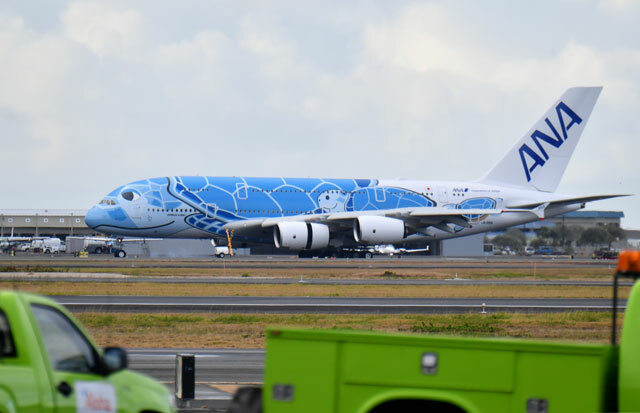 All Nippon Airways - ANA completed a test flight of its new aircraft, the giant Airbus A380 to Hawaii earlier this week. 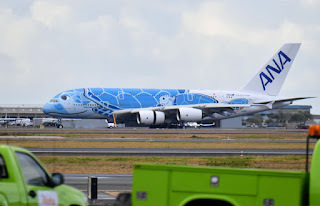 The Japanese airline completed the first of two tests between Tokyo’s Narita International Airport and Daniel K. Inouye International Airport in Honolulu on Wednesday, April 17th ahead of putting the double-decker on the route. The test flight was completed with two pilots, three ANA staff and three representatives from Japan's Civil Aviation Bureau and is another step towards the carrier's goal of doubling the number of seats between Hawaii and Japan by 2020. ANA operates three flights a day at present using the Boeing 787 aircraft. KLM, the Royal Dutch Airline, will be starting a brand new service to the heart of the Neapolitan Riviera, the port city of Naples. 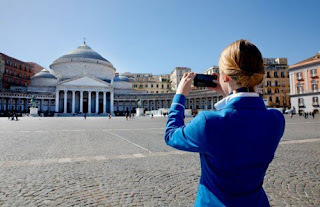 This vibrant and beautiful Italian port city will be KLM's tenth destination in Italy, which we will be operated on a seasonal basis during the summer months. The airline will be operating the route daily during July and August with Boeing 737-700/800 aircraft. For the rest of the season, the airline will only fly there at the weekend. Air Italy, has reluctantly decided it will have to pull away from the 'Public Service Obligation routes from Sardnina it announced on Tuesday 16th April. The news follows a meeting with President Solinas held in Villa Devoto in the presence of a delegation from Air Italy and Alitalia, however, the proposal given to the airlines was unsustainable according to Air Italy. Air Italy has stated on several occasions that it is not able to share routes from Olbia with Alitalia, the routes just don't attract enough passengers to break even for two airlines. 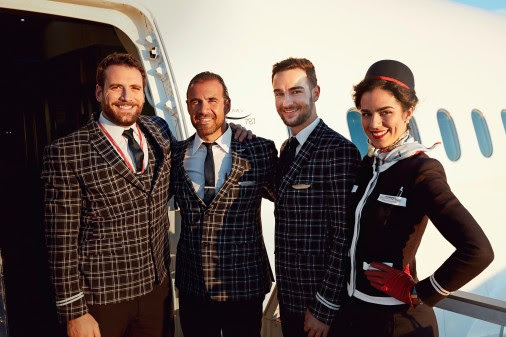 On 12th March, Air Italy agreed to fly from Olbia to Rome and from Olbia to Linate (and vice versa), without financial compensation from the government, to protect its staff of over 500 people and the investment made over the last 50 years in the service of Sardinia. Unfortunately, the proposed solution would not guarantee these objectives and would result in an even more negative result than that already envisaged in the proposed no-compensation solution. Therefore, having both Alitalia and Air Italy on the routes will make them untenable. 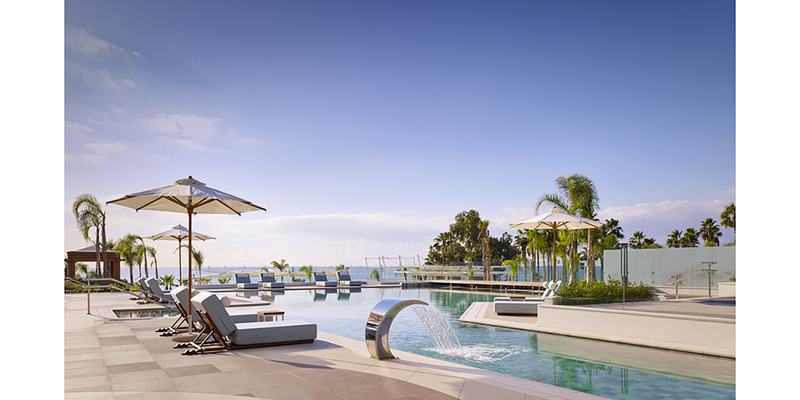 The Luxury Collection, part of Marriott International announced this week the opening of Parklane, a Luxury Collection Resort & Spa, Limassol. The exciting property is owned and operated by Parklane Hotels Limited, and marks Marriott International’s entry into Cyprus – and the first international luxury branded resort in the country. Parklane joins an ensemble of over 100 Luxury Collection hotels and resorts in more than 30 countries and territories, offering world travellers indigenous and intimate, local experiences. Delta employees along with representatives from Los Angeles World Airports (LAWA), contractor Hensel Phelps, and design firms Gensler and Arup gathered for a celebratory event to mark the milestone in the project, which will modernize, upgrade and connect Terminals 2, 3 and the Tom Bradley International Terminal (Terminal B). The event was held in an area of the terminal that is now closed to the public as construction gets underway and included a ceremonial wall demolition. Attendees also signed a steel girder that will be placed in the final facility. 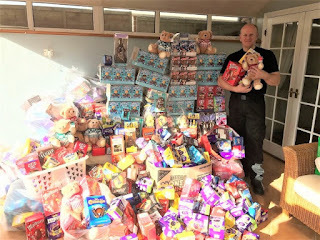 Simon Phillips, a firefighter with White Watch at London Stansted, will bring Easter joy to hundreds of children from across the region thanks to the egg-ceptional generosity of companies and people across the airport and in the local community. Simon has collected over 2,000 Easter eggs from big-hearted businesses and colleagues across the airport which are being donated to hospitals and children’s charities across Essex and Hertfordshire. This is the sixth year Simon has successfully taken on the challenge of the annual egg collection, seeing him collect nearly 7,000 eggs to date, bringing a smile to the faces of children unable to be at home for Easter or facing family hardship. The largest US carriers (and their alliance partners) control about 90% of all transatlantic traffic. As sanctions and route restrictions being placed on Qatar Airways and Air Italy imposed by the US become a strong possibility, the Italian airline Air Italy wants to set the record straight, it issued the following statement on Thursday 19th April. It's almost the Easter weekend when so many people go off on a quick break or swap chocolate eggs or perhaps both, so the UK's British Airways has hit on an amusing competition to get some more publicity! The carrier will be flying almost 200,000 customers around the world, reuniting families and loved ones this weekend, so the carrier is appealing to customers travelling between Friday, April 19 and Monday, April 22nd to tell them why they’ve been a Good Egg over the weekend, by Tweeting British Airways using the hashtag #BAGoodEgg. As the new official airline of the Pensacola Blue Wahoos, the Floridian Silver Airways, the leading airline of the I-10 Gulf Coast region, unveiled the first themed aircraft for a Double-A Minor League baseball team. 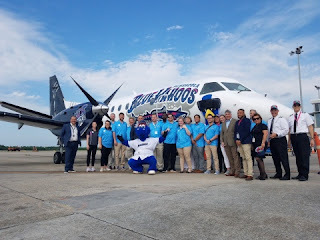 The Saab 350 with a bright new livery has been named after the Pensacola Blue Wahoos’ mascot, “Kazoo” and rolled out of the carriers Orlando maintenance hangar today and made its maiden flight to Pensacola International Airport where it was unveiled to the ball team and the local community. 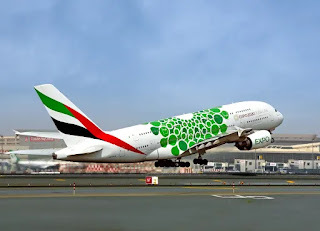 There will be even more choice for Emirates passengers going to or from Riyadh, Saudi Arabia from 21st April when the Dubai based carrier introduces the super spacious A380 into the schedule. 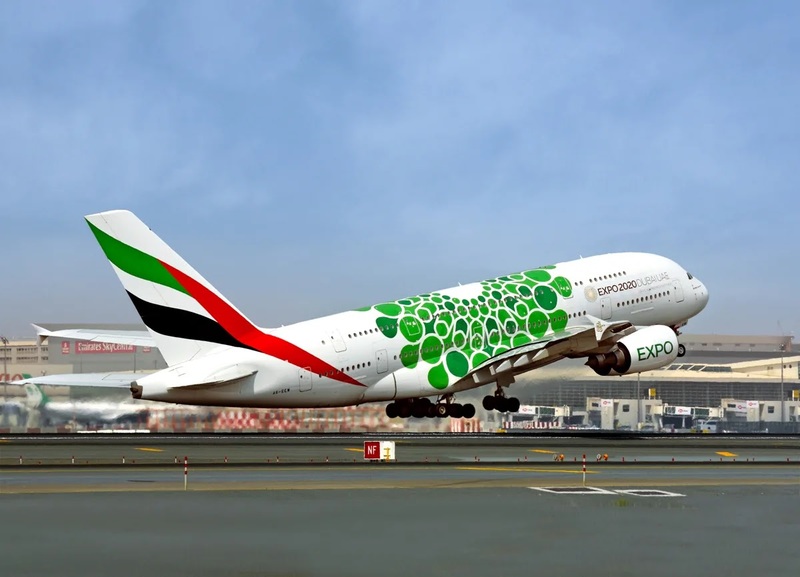 Riyadh, the Saudi capital and most populous city will be the 51st destination to join the Emirates A380 network. From 21st April flight EK817/818, currently operated by a Boeing 777-300ER, will now be operated by the iconic and highly popular A380. EK 817 will depart Dubai at 1850, arriving in Riyadh at 1935. The return flight EK 818 leaves Riyadh at 2125, arriving in Dubai at 0035 the next day. British Airways’ singing pilot Stuart Beech, who rose to fame on Michael McIntyre’s BBC 1 ‘Big Show’, returns home to Manchester in May to help more people overcome their fear of flying. 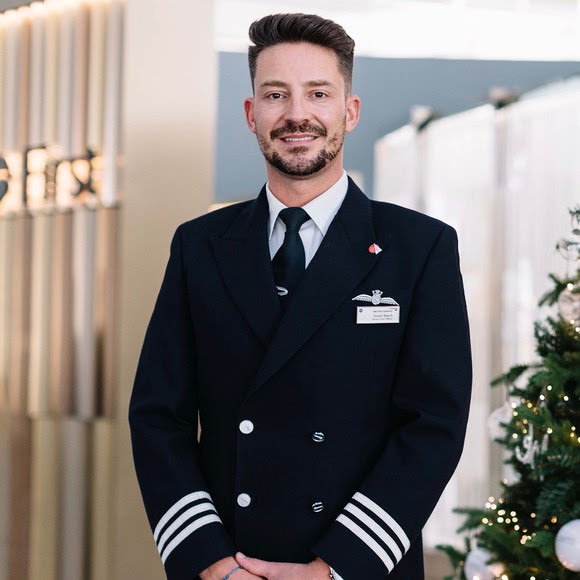 Stuart, from Oldham, Greater Manchester, is part of the British Airways’ Flying with Confidence team who have helped more than 50,000 nervous customers take to the skies since the courses first started over 30 years ago. It was during one of the courses at Christmas that comedian Michael McIntyre surprised Stuart and invited him to fulfil a lifelong ambition and sing in front of a packed house at London’s Theatre Royal. CFM investigating LEAP -1A & 1B engine issues. The aircraft engine giant, CFM International, is said to be monitoring closely its LEAP engines following a build up issue said to be behind the engine failure on a Boeing 737 Max 8 of US budget carrier, Southwest Airlines on 26th March. CFM has told operators to inspect the LEAP-1A and -1B engines looking for a build-up of carbon or other materials on fuel nozzles. This build-up, often called coking, could cause hot-spots and premature wear which could cause a failure in the turbine blades. Its believed it was this that caused the engine failure Southwest jet on a ferry flight to Victorville for storage from Orlando. 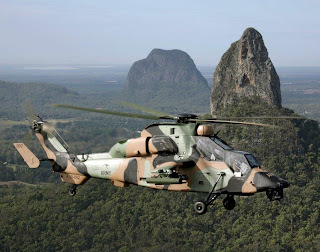 Airbus has been awarded an extension of the Australian Army’s Armed Reconnaissance Helicopter (ARH) Tiger through-life support (TLS) contract by the Australian Department of Defence, it was announced this week. Norwegian has been named ‘Best Best Low-Cost Carrier in Europe’ at the prestigious 2019 Passenger Choice Awards. The APEX Passenger Choice Awards represent one of the highest accolades in the industry as winners are directly voted for by passengers and take into account factors such as seat comfort, cabin service, food and beverage, entertainment, and Wi-Fi. Norwegian was the first airline to offer passengers free in-flight Wi-Fi on all European flights in 2011. The airline became the first to introduce live television over the skies of Europe in 2015 and in late 2018 it took delivery of its first Boeing 787-9 Dreamliner equipped with inflight Wi-Fi. In 2019 Norwegian became the first low-cost airline to offer customers free Wi-Fi for the full duration of intercontinental flights. Customers can choose the service that suits their requirements between a completely free package to a premium service allowing the streaming of video and other multimedia content.